Is your offer unique? Or do you disappear in the mass of similar products? Stand out from the competition now - with your USP in marketing. In this blogpost you can find out, what USP is all about. Many entrepreneurs start the adventure of advertising and external representation without having answered the question, how they actually want to convince the customer. But that is exactly what should be clear beforehand: How do I position myself? What distinguishes myself from my competitors and how can I show it? This is where the Unique Selling Proposition (USP) in marketing comes into play. 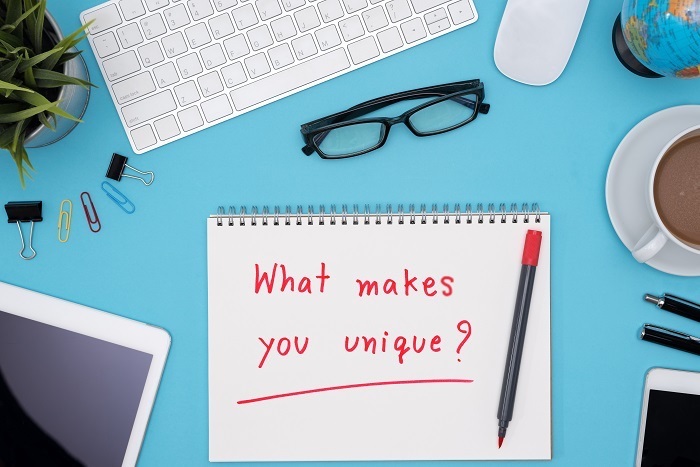 With your personal unique selling proposition you answer all the questions I asked at the beginning: You formulate your unique selling proposition, you present exactly the one detail with which you stand out from the competition. This unique selling point should consistently correspond to your general positioning, i.e. your corporate strategy. a particularly good price/performance ratio? Of course, it is also possible to outdo the competitors through a strong brand without offering the customer greater benefits over competitors. A suitable example here are cigarette brands, which actually all offer the same. Nevertheless, there are brands that are more popular than others. Generating a competitive advantage merely through a strong brand in most cases is rather unrealistic for smaller companies, however, because it requires a degree of awareness that SMEs simply do not have. That's why your USP is so important in marketing. Because if you don't have a unique selling point or don't present it properly, there is no reason for customers to prefer your company to others. The USP also offers you a solid basis for all your marketing activities - why? Well, simply because you can build up any self- or product advertisement around your unique selling proposition - I'll go into that in more detail right away. It can also make sense to use the unique selling point as the core of your public image and to use it in your company slogan, for example. One example is a butcher whose slogan is: "More regionality - more quality" and who thus emphasises the advantage over supermarkets that his meat is not transported halfway through the Republic but delivered fresh by farmers from the surrounding countryside. It is of course extremely important at this point that your unique selling proposition is credible and that you can keep to the benefits you present. It makes absolutely no sense to advertise a unique selling point that you cannot offer. The butcher from above would certainly not advertise his business model (high quality, regional meat) with the slogan "The cheapest and best meat in the city", because he cannot - understandably - keep this promise. In marketing, the USP also becomes a tool for addressing target groups, because it already limits the circle of addressees. With its slogan for regional and high-quality meat, the butcher, for example, does not address the group of people who only look at the price when buying meat, but rather the target group of conscious meat eaters. The unique advertising proposition (UAP) is based on the unique selling proposition (USP) from above. In short, UAP is a unique selling point within your advertising. Once again, the question is how you differ from your competitors - this time in the context of advertising. The example of the butcher from above, who communicates his USP in marketing within his slogan ("More regionality - more quality") towards his customers, is already a form of unique advertising proposition. The main aim here is to communicate one's own unique selling proposition uniformly and repeatedly in one's advertising. The butcher already achieves this with his slogan "More regionality - more quality" and would use this slogan in any form of external presentation, whether on flyers or on the display in front of his shop. On the one hand, the slogan presents the unique selling point of a company, but on the other hand, it also serves as a unique and unmistakable advertising message. For example, you probably recognize “Yes we can” without me telling you, what or who this slogan should advertise. That means, individual advertising messages can be so concise that you can recognize the origin of the message without any further help - regardless of whether it is a brand or Barack Obama himself. If you are developing a unique advertising message, you should consider using it in the long term. The perceived connection between an advertising message and the name of a company takes time - a constant change of the advertising message is therefore not very effective. Instead, concentrate on a message that suits you and which you can use in the long term. Ultimately, with UAP and USP you can present your unique selling proposition to your customers in marketing and also distinguish yourself from the competition through external presentation. For both, it is extremely important that they also fit your company. On the one hand, the promised unique component of the offer (USP) should really exist, on the other hand, you have to connect a unique advertising message with your company. Overall, the unique selling proposition and unique advertising proposition are thus an integral part of your company's product and communication policy.